There are few easier to grow garden plants that will also add that tropical touch to the garden and ask for so little in return. They are valued mostly for their large tropical foliage and showy, brilliantly coloured flowers. Cannas, or canna lilies, are easily grown tender perennials native to tropical and subtropical areas. canna lilies The most popular kinds of cannas have beautiful gladiolus-like flowers perched high above the large, paddle-like leaves. The flowers are typically red, pink, orange, yellow or any combination of those colours. Cannas come in many different sizes – from dwarf plants of about 40cm tall to giants of up to 2-3 metres. The low growing varieties (90-140cm) are perfectly suited for small gardens, apartments, terraces, roof gardens or any other area with limited space. They look fantastic in masses and also grow well in pots. A large flower pot full of cannas really brightens up a sunny patio or porch. With the diversity in size and colour cannas are great everywhere. With their fast growth they will quickly transform any garden into a tropical paradise. If you require seeds this is an interesting little selection, do click into here. They do deliver to main land Spain in just a few days only. This is an invitation to come and have a look at Spanish gardening Groups Facebook page. https://www.facebook.com/groups/1623745237901625/?fref=ts It is called Hints and tips about gardening in Spain. The pitfalls and the joys. Limited advertising is allowed provided it is on subject. They love and need the sun, but in our hot summers they will do fine also in partial shade. They thrive under high summer temperatures. While many plants wither away in the summer sun, cannas really kick in to show you just how magnificent they can be. The only limiting factor in their growth at this time usually is lack of adequate moisture and fertilizer. Cannas grow best in a rich soil with lots of natural matter. Cannas will also grow in poor soil, but the leaf size and color will suffer. In the end, the flowers might be smaller or the color may be dull. They can take small periods of dry soil, but they cannot take drought situations. 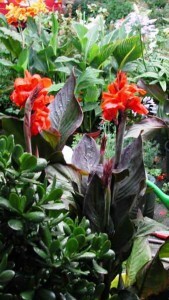 Planting & careCannas or Canna Lilies. Cannas are not hard to grow, just plant the rhizomes (fleshy, underground rootlike structures) about 15cm deep and let the plants do the rest. Cannas are a wonderful thing because they will move closer to the soil level or deeper in the soil depending on what they need. To assure continuous bloom throughout the summer, remove the dead flower heads so seeds do not form. Usually a second flowering shoot, growing from the node just below the dead flower, will be halfway in bloom already. Remove this shoot also when its blooms are withered. Another flowering shoot will soon develop on the node below. If the dead flowers are not removed, the plant will concentrate its energy on developing seed pods instead of new flowers. When they are done flowering and start to whither, leave the foliage for about six weeks for the rhizomes to gather nutrients) before cutting them down and removing any dead stems. Some recommend a yearly dig up and cleaning of the rhizomes, however, mine have been in the ground for 4 years now and are still doing great. The golden rule in gardening is: “If it ain´t broken, don´t fix it”. So, if what you are doing seems to work well – continue doing it that way. Cannas are not often bothered by problems. The leaves are covered with a waxy substance, so water is repelled and fungus does not usually take hold. However, grasshoppers, slugs and caterpillars may munch the leaves. Cannas produce seeds which you can try planting, but the easiest propagation method is rhizome division. Every plant in the ground can produce two and sometimes three bulbs in one season, making it easy to have a good display very quickly. Does your garden lack zing? Are your borders a bore? Spice them up with a touch of the tropics! Tropical plants bring sizzle to every garden. Bananas in Maine, cannas in Canada – these plants can be grown everywhere. Whether used in containers or planted directly in the ground, their bold leaves and over-the-top flowers create instant drama. Pam Baggett chooses 100 of the best tropical plants and shows readers how to grow them, how to combine them with other plants, and how to make eye-popping compositions of color and pattern. Love flaming orange? 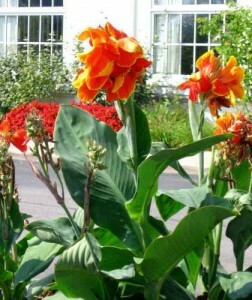 Try cannas, lantanas, and ‘Fire Dragon’ coleus. Screaming magenta more your taste? Go for hot-pink four o’clocks, bloodleaf, and ‘Cranberry Punch’ pentas. If you’re passionate about purple, grab princess flower, Brazilian skyflower, and ‘Purple Majesty’ sage, “Tropicalismo!” offers hundreds of ideas for turning gardens, decks, and patios into a visual fiesta. A taste of the tropics is all it takes to turn your garden into a paradise. Growing Canna Tropical Flowers -How To Grow Calla Lily Lilies Flower From Seeds -Backyard Gardening. 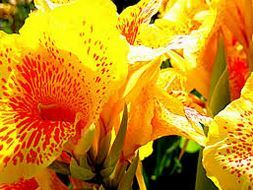 Learn how to grow Canna flower from seed / seeds and learn how to multiply your existing tropical Canna Lily flowers by collecting its seeds, germinating them, growing them and planting them in the ground for you to enjoy the flowers years after year. It may take years for Canna Lilies seed to germinate if you rely entirely on the natural process of them falling into the ground since the hard shell of the seeds takes time to break and germinate. This YouTube video will show you some tips and techniques how you can fasten the process and grow Canna flower in few months instead of years, watch video for some backyard family gardening tips and tricks. Additional information after you watch the video above. During the germination process, we had around 96% germination success rate. As mentioned in the video, germination of the seeds takes around 48 hours, but during the filming on this video, we had cold spell and the germination was slow and it tooks more days for the seeds to germinate. If you require seeds theis is an interesting little selection, do click into here. They do deliver to main land Spain in just a few days only. 46,50,23,8,36,43,photo size 50,10 RICH GOOD,15. 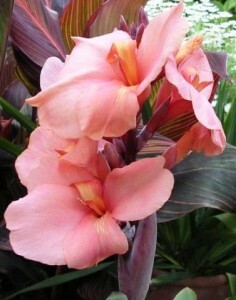 Cannas or canna lilies are easily grown tender perennials native to tropical and subtropical areas.